Nature&apos;s Way Artichoke Extract is standardized to 5% caffeoylquinic acids. 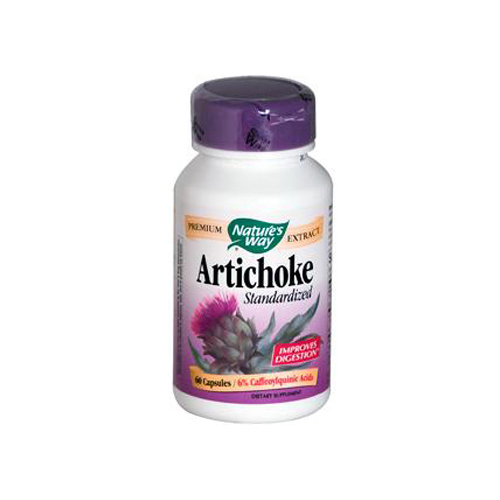 Artichoke improves digestion. Research shows this key active increases liver bile production, which assists the body with blood fat metabolism. Primarily, Artichoke is used for proper function of the digestive system (i.e. liver, stomach, and gallbladder). Though it may help clear up one&apos;s constipation, it is not a laxative and should not be used as such. Artichoke (dried extract), milk thistle (seed), gelatin, magnesium stearate, maltodextrin, and silica.